Wharton Business school’s neverending MBA and the future of higher ed. Is the future of higher education a program from which you can never graduate? It’s part “Hotel California,” part schlock horror movie, but with way more synergy: A business school where once you matriculate, you can never leave. Alas, this is not my pitch for the world’s least-interesting new reality series (well, second-least interesting: I also have a pitch for “Dissertation Emergency!”). 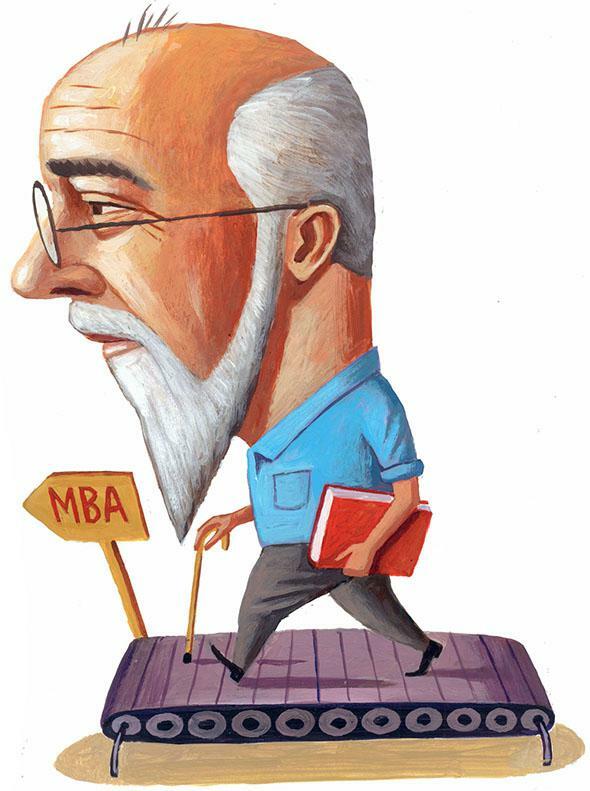 No, it’s serious: Some professors at the top-ranked business school in the country see the eternal recurrence of the MBA as a foregone conclusion. According to a recent post on the Chronicle of Higher Education’s Wired Campus blog, two faculty members at the University of Pennsylvania’s Wharton School envision an MBA of the future—one you never finish. Sort of, this is sheer genius. Sort of, it’s the most terrifying development in higher education since a hilariously tone-deaf provost insisted that universities should be run more like international luxury cruises. To be fair to Wharton’s Christian Terwiesch and Karl T. Ulrich—the latter of whom is “vice dean of innovation”—they developed the idea for the MBA of the future (detailed in this paper) based on trends in higher education (i.e., MOOCs) and legitimate needs they see in their students and alums. What students need the most in the short term is access to Wharton’s exclusive network; the classes themselves, Terwiesch and Ulrich argued, impart material that likely won’t be “deployed” until many years later. So instead of “learn-learn-learn-certify-wait-wait-wait-deploy,” the professors write, students could begin with a ten-month hobnobbing boot camp, and then be foisted unto the business world, whereupon they’d “subscribe” to MOOCs of the courses they needed, as they needed them. On the one hand, this isn’t a half-bad idea when you consider the needs of many students at elite business schools. So many already possess almost all of what they need to succeed—entrepreneurial spirit, colored shirts with white collars—before they begin their degree. What they need from a place like Wharton is, in short, the name “Wharton,” and access to the professional doors that open with its dropping. They also need a cohort of like-minded and like-ambitioned folk to hobnob, share ideas, trade monocles, buy trains—whatever it is business guys do. Back when I was in grad school, I used to walk home from seminar—deep in ruminative contemplation about how I’d make dinner from five rice noodles and a half-empty bottle of Two-Buck Chuck—and I’d invariably pass the weekly cookout at the UC–Irvine business school (nicknamed the Hot Pocket School of Management after its founder’s fortune in molten microwave pastries). Those B-students were flaunting their free hot dogs and beer, simply the first of many ways in which their lives would be more successful than mine. But what I soon realized was that the cookout was part of their curriculum—possibly the most important part. They formed partnerships at that cookout; they invented companies at that cookout; they learned how to speak, act and be business at that cookout. In class? Who can pay attention in class, when you’re so full of hot dogs and beer—and dynamic synergy? Anyway, as Terwiesch and Ulrich suggest, by the time it came to “deploy” information about, say, applied probability models in marketing, the brain cells carrying that information were probably long ago flushed down the toilet on some yacht. And there are other consequences as well: Even for a pre-professional program where your corpus of earned knowledge is secondary to the connections you make, is there not something psychically important in the finality of a terminal degree? Yes, never stop learning, great, I agree—but there’s a difference between taking a MOOC on lacto-fermentation for personal edification, and never truly finishing your master’s degree. The psychological consequences can be profound—just drop by a humanities PhD program to see what a decade-plus in graduate school does to a person. In Kafka’s The Trial, Josef K.’s lawyer gives him the option of filing for a Verschleppung, or protraction. He will remain “free” while the minutiae of his case are dragged out, interminably, so that he simply stays on trial until he dies of natural causes. I think business students might prefer not to be stuck taking a crash course on M&A as hungover 24-year-olds, one they have to refresh 15 years later. Because at least now their time in school has a concrete end—which everybody’s time in school deserves, from MBA to Ph.D. and everything in between. In The Trial, rather than choose the Verschleppung (or its equally-enticing companions), K. fires his lawyer and gets stabbed to death in an alley. It might make him feel “like a dog”—but hey, at least it’s finite. If the interminable MBA of the future does take hold, they should probably make some room on the syllabus for Kafka.